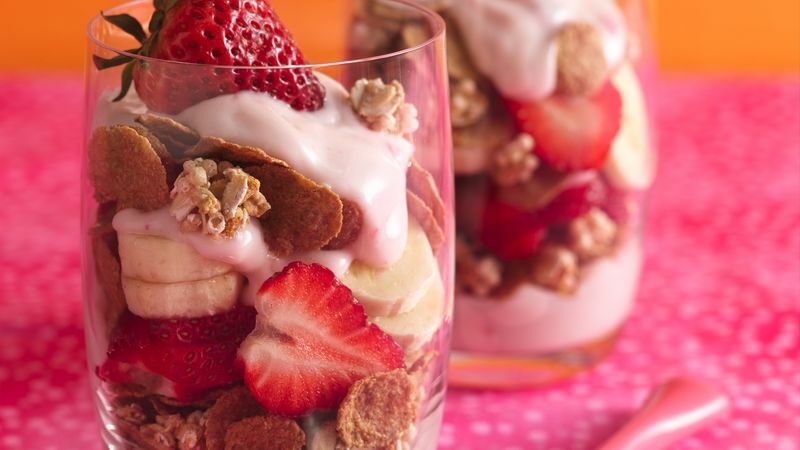 In each of 4 (10-oz) plastic cups or parfait glasses, layer 2 tablespoons yogurt, 1/4 cup cereal, 1/4 cup strawberry slices and 1/4 of the banana slices. Top each with 2 tablespoons yogurt, 1/4 cup cereal and remaining yogurt. Garnish top of each parfait with whole strawberry. Make one big parfait and let everyone serve themselves. Use your favorite fruits for the strawberries and banana.